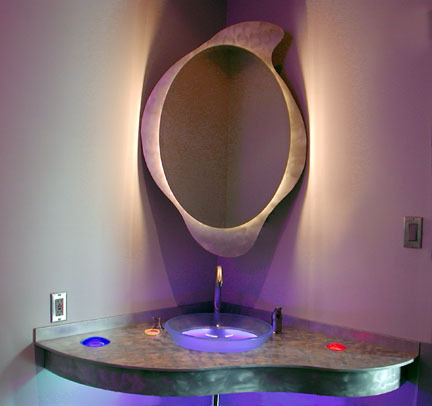 glass mirror size: oval 31" x 22"
aluminum background size: 41" x 28"
The mirror consists of an oval, beveled mirror mounted on a curvilinear background of brushed aluminum with sandwiched white neon casting its glow on the aluminum, providing a soft illumination for the room. The mirror simply lifts off for easy cleaning and access to the neon when necessary. The entire mirror ensemble mounts simply on a bracket for easy installation. 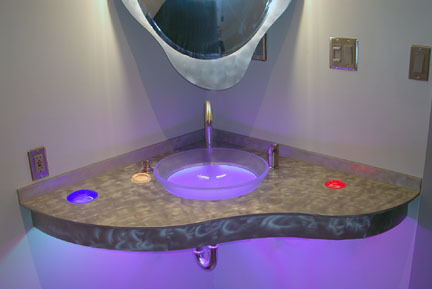 The bathroom counter is heavy duty brushed aluminum with glass lenses and frosted glass sink underlit with neon. The aluminum is heavily coated with an industrial clear-coat to provide lasting protection and ease of cleaning.